Chicago was a great movie. So were Cabaret, West Side Story and The Sound of Music. But for every stage musical that made a successful transition to the multiplex, you can probably think of four or five that didn’t. So it’s not really surprising that the movie version of Jersey Boys isn’t half as much fun as its live predecessor. Director Clint Eastwood made some good choices and some bad choices when he went about adapting Marshall Brickman and Rick Elice’s biographical tribute to the Four Seasons. One of the good choices was casting people who’d already proved themselves in the stage version, rather than following the usual practice of hiring film stars. That guaranteed that the actors playing the 1960s rock group could actually sing (unlike, say, Russell Crowe in the big-screen version of Les Miz). One of Eastwood’s questionable choices was hiring Brickman and Elice to adapt their own hit musical. You’d think that would be a plus, as it would encourage the movie to stay true to the original, but staying true to the original isn’t necessarily a good thing. Not to belabor the obvious, but a movie and a stage musical are two entirely different animals. On the stage, we can put up with dramatic developments being delivered in a kind of shorthand, as their main purpose is to propel us toward the next tune. In a movie, we generally need more realism. We don’t get that in Eastwood’s Jersey Boys. Not only do many of the characters come off as Italian-American stereotypes, but the dramatic developments often hit us without warning, depriving them of their potential power. That’s especially true of lead singer Frankie Valli (John Lloyd Young), who’s faced with one emotional setback after another involving the women in his life—none of whom we’ve really gotten to know. Compounding the problem, Young gives a rather unemotional performance in the role he originated on Broadway, though he makes up for it every time he launches into his dead-on impersonation of Valli’s falsetto warbling. 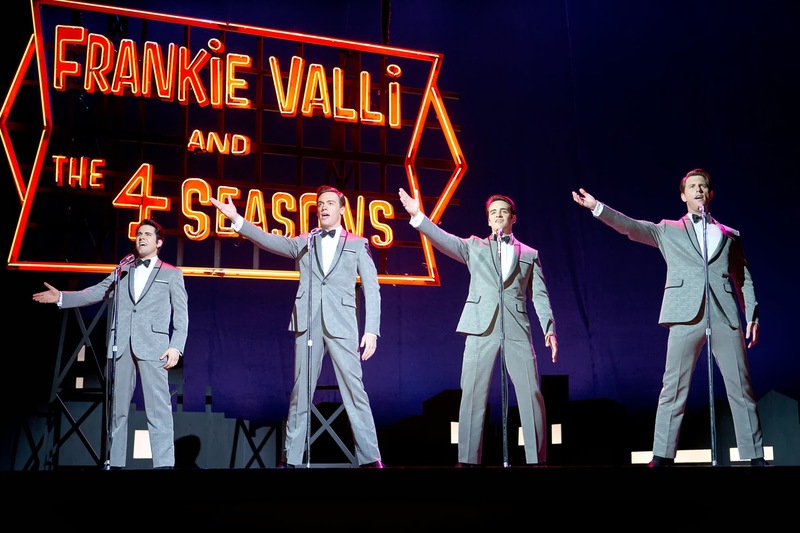 The actors playing the other members of the group—Vincent Piazza as unscrupulous control freak Tommy DiVito, Erich Bergen as songwriter Bob Guadio and Michael Lomenda as bass-voiced Nick Massi—are all fine. Even so, the movie seldom gives us a feel for what drives them other than their egos. And economic necessity: In an early voice-over, Tommy says the only ways to escape from their blue-collar New Jersey neighborhood are the Army, the mob and fame. Speaking of the mob, it’s well represented by Christopher Walken as “Gyp” DeCarlo, a paternal gangster with a soft spot for the group’s music. The film does manage to open the story up a bit in the first act, as when Frankie is roped into an attempt to rob a jewelry store. The heist goes humorously wrong when the would-be crooks attempt to load a huge safe into the trunk of an old Studebaker, with disastrous results. Mostly, though, Eastwood sticks to the stage musical’s arc, which allows the members of the group to take turns narrating the Four Seasons’ rise from obscurity to Top 40 success, even as the quartet is wracked by jealousies and financial problems. Like the original, the movie is at its best when it re-creates the band’s big hits, like Sherry, Walk Like a Man and, best of all, the Valli solo Can’t Take My Eyes Off You. Unfortunately, there aren’t nearly enough moments when the musicians are allowed to set aside their problems and just rock out. As if to make up for this dearth, the closing credits are projected over a Bollywood-style song-and-dance number involving the whole cast, belatedly capturing the kind of energy that made the stage production a Broadway hit.